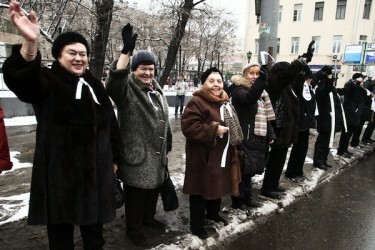 On Sunday, Feb. 26, thousands of people gathered in central Moscow for the Big White Circle protest, forming a human chain along most of the length of the Russian capital's 15.6-kilometer/9.7-mile Garden Ring, protesting against corruption and demanding a fair presidential election, which is to take place in one week, on March 4. 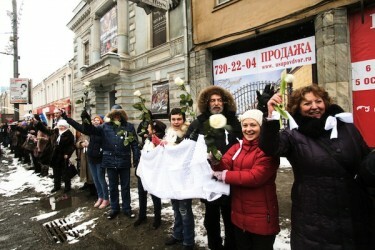 The Big White Circle protest for fair election: people stood along the Garden Ring in Moscow, holding hands and waving white ribbons, flowers and balloons. Photo by MARIA PLESHKOVA, copyright © Demotix (26/02/12). The whole world has noticed, while the [state-owned] Channel One hasn't. The Big White Circle protest. Photo by MARIA PLESHKOVA, copyright © Demotix (26/02/12). [...] A white circle, a live circle. It is becoming more and more obvious that the angry [PM Vladimir Putin] has already lost. He can no longer stop this avalanche of positive resistance. Some people were saying that we wouldn't be able to close the circle around the Garden Ring. Aha... We have closed it, in two rows. The first one - with the pedestrians, the second - with the drivers. More photo reports can be found in the live_report LJ community (by LJ users tushinetc and semasongs), as well as in the namarsh-ru LJ community (by LJ user belial_68). The next opposition rally is planned for March 5, the day after the election. 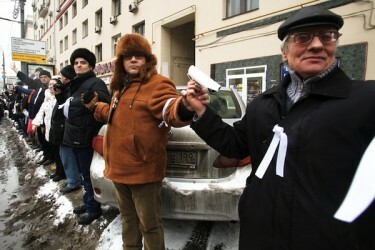 Moscow city authorities, however, have rejected the opposition's request to hold the rally on Lubyanka Square. We need to avoid making a mistake as we search for the right decision for March 5. [...] History is again offering us a strange and powerful rhyme. It is hinting on something important. March 5 isn't just a random day for all of us.